Terms such as "The Lord's Supper: (1 Corinthians 11:20); "the breaking of bread" (Acts 2:42); "communion" (1 Cor. 10:16); and "the table of the Lord" (1 Cor. 10:21) are biblical expressions designating an act of worship. "Eucharist," "sacrament" and "church ordinance" are terms invented by men (they are not found in the Bible) to designate the Lord's supper. Jesus instituted the Lord's supper in an upper room of a house in Jerusalem on the night before his crucifixion. Four accounts of this event are presented in the Bible (Matthew 26:26-29; Mark 14:22-25; Luke 22:17-20; and 1 Cor. 11:23-26). His words were anticipatory. The memorial was established before the event it commemorated took place. Jesus instituted the Lord's supper immediately after he and his disciples partook of the Passover meal. Because of this close connection, the Passover meal is an important background for understanding the Lord's supper. God instituted the Passover meal as Israel's celebration of deliverance from slavery (Deuteronomy 16:1-8). The Lord's supper is the Christian's memorial of what it cost God to deliver him from the slavery of sin. The covenant meals in the Old Testament provide another background for the Lord's supper (Genesis 18 - the renewal of the promise of a son to Abraham; Gen. 31- a sign that there world be peace between Jacob and his father-in-law; and Isaiah 25:6-10 - descriptions of the coming salvation). After Jesus gave the disciples the fruit of the vine, he said, "For this is my blood of the New Covenant. . . " (Matt. 26:28). Subsequently, the Lord's supper is a renewal of the covenant, entered into at baptism, that the Christian has with God. The Lord's supper is a memorial service. Jesus said, ". . . this do in remembrance of me" (Luke 22:19). Jesus left no shrouds, personal relics or statues of himself - only an unpretentious act, the Lord's supper. The Lord's supper is the world's greatest monument commemorating the world's greatest event. As Christians remember Jesus' sacrifice on the cross they become conscious of their past need (they were sinners without hope), and their present responsibility (to live a life of purity and devotion to God). To partake in a worthy manner, each participant is to examine his life in light of the terms of the New Covenant (1 Cor. 11:27-28). Although the Christian's self examination is not restricted to the worship assembly (2 Cor. 13:5), each should thoroughly examine himself just before partaking of the bread and the fruit of the vine. The self-examination is for the purpose of identifying and repenting of any sin in one's life (Psalm 139:23-24). Proverbs 28:13 says, "He that covereth his sins (not bringing them out in the open by self-examination) shall not prosper: but whoso confesseth and forsaketh them shall have mercy" (God will accept his worship). When observed in a worthy manner, the Christian leaves the Lord's supper with renewed spiritual strength gained by (1) his reflection on why Jesus had to die and by (2) his renewed determination to live out the terms of the New Covenant. The Lord's supper is made up of two elements - the "bread" and the "cup." The bread of the Passover meal was unleavened bread (Exodus 12:17-20; Matt. 26:17-20). The leaven (which is a yeast that causes dough to sour or ferment) was to be removed from the house for a seven-day period (Ex. 12:15,19). Jesus instituted the supper immediately after he and the disciples observed the Passover meal. To suggest that Jesus had leavened bread in the upper room is to accuse him of violating Exodus 12:15,19. Jesus used the word "leaven" in a figurative sense to denote corruption (Matt. 16:6; Luke 12:1 - cf. 1 Cor. 5:6-8; and Galatians 5:9). The unleavened bread is symbolic of Christ's body (Luke 22:19). Therefore, the "bread" is without leaven, even as Christ is without corruption or sin (Hebrews 4:15; 7:26). No leavening agents were present in the Passover meal because it was to be a perpetual reminder to the Hebrew people (Ex. 12:25-27) of the "haste" in which they left Egyptian slavery (Deut. 16:3). Likewise, the absence of "leaven" in the bread of the Lord's supper reminds the Christian of the "haste" in which he left the slavery of sin. The "cup" contained the "fruit of the vine." The word "wine" (which can mean either unfermented grape juice - Isa. 65:8; John 2:1-11 or fermented grape juice - Prov. 20:1, depending solely on the context) is never used in the Bible to refer to the Lord's supper. Only the terms "fruit of the vine" or "cup" are used. The "fruit of the vine" is symbolic of Christ's shed blood (Mark 14:23-25; Matt. 26:27-29). Because it is pure and wholesome it is a fit symbol of the life-giving blood of Jesus Christ. Many religious people believe that the "bread" and the "fruit of the vine" become the literal or actual "body" and "blood" of Jesus Christ. Matthew 26:26-28 says, "...Take eat; this is my body. . . Drink ye all of it; For this is my blood of the new testament (i.e. covenant). . . " When Jesus took bread and said, "this is my body" he was living in his earthly body. If the bread became his literal body then he had two literal bodies at the same time. If, as Jesus spoke the words, "this is my body", he had suddenly disappeared, and the apostles had seen nothing but the bread - they would have understood that his body had been miraculously transformed into bread. However, his body was still there, and his blood was still flowing in his veins, proving that Jesus was not teaching a miraculous transubstantiation. John 6:53 says, ". . . Except ye eat the flesh of the Son of man, and drink his blood, ye have no life in you." The context shows that Jesus was not talking about the Lord's supper. Verse 60 suggests that the disciples took the statement literally. But Jesus corrected their misconception in verse 63 by showing that his statement referring to the eating of his flesh and drinking of his blood (verses 53-59) was figurative - "It is the spirit that giveth life; The flesh profiteth nothing : the words that I have spoken unto you are spirit, and are life." Men eat the flesh and drink the blood of Christ by accepting his words and bearing them out in their daily living. In addition, the Lord's supper is a memorial - ". . .this do in remembrance of me" (Luke 22:19). Memorial services are not held for people who are physically present. If the Lord is physically present in the bread, the Lord's supper could not be a "memorial" service. Immediately after Jesus instituted the Lord's supper he said that he would not partake again until they were in the kingdom (Matt. 26:29). In Luke 22:30 Jesus said, "That ye may eat and drink at my table in the kingdom . . . " The kingdom was established 52 days later on the day of Pentecost. The term "kingdom of God" is Old Testament terminology expressing a New Testament concept - namely, the church. 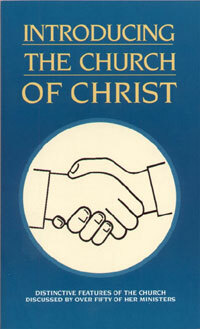 The kingdom and the church are one and the same institution (Matt. 16:18-20). Jesus said that the Lord's table was to be "in the kingdom" (Luke 22:29-30). The Lord's table was in the church at Jerusalem, Troas and Corinth (Acts 2:42; 20:7; 1 Cor. 10 and 11). therefore, the churches of Christ at Jerusalem, Troas and Corinth were in the kingdom. The Lord's supper is authorized only for those who are citizens "in the kingdom" - i.e., members of the Lord's church. Some say that the kingdom is not now in existence. But those not in the kingdom have no authority to eat at the Lord's table. Do all Christians (those in the kingdom) have a right to partake? The Bible does not use the words "open communion" or "closed communion." First Corinthians 11:28 says, "But let a man examine himself (notice we are not to examine each other), and so let him eat of the bread and drink of the cup" (notice every Christian is to partake of both emblems). Jesus said, ". . . this do in remembrance of me" (Luke 22:19). The frequency was not revealed to the apostles until the kingdom was set up 52 days later on the day of Pentecost. From that time on, Christians observed the Lord's supper on a weekly basis. Acts 20:7 says, "And upon the first day of the week, when they were gathered together to break bread. . . " The first day of the week comes 52 times a year. When Christians meet together "each " first day of the week, they are meeting on "the" first day of the week, according to the example in Acts 20:7. "Every" first day of the week is conveyed by the use of the definite article - -"the " first day of the week, not "a" first day of the week. Just as the Jews knew the command to observe "the sabbath" (Ex. 20:8) meant "every " sabbath, so, Christians know the example in Acts 20:7 means "every" first day of the week. As a result of this weekly observance, the church at Jerusalem is said to have "continued steadfastly" in the breaking of bread (Acts 2:42); and the church at Corinth observed the Lord's supper "often" (1 Cor. 11:25-26). The observance of the Lord's supper is the only act of worship that is limited to the Lord's day - "And upon the first day of the week, when the disciples came together to break bread . . . " (Acts 20:7). Not only are Christians to observe the Lord's supper "every" first day of the week - they are only authorized to partake "on" the first day of the week. It is true that Jesus instituted the Lord's supper on a Thursday, but he said that he would not partake again ". . . until that day when I drink it new with you in my Father's kingdom" (Matt. 26:29). The only day that the Lord's supper was observed in the kingdom was "on" the first day of the week (Acts 20:7). Even the apostle Paul did not have the authority to partake on any day other than the first day of the week. In Acts 20 Paul was on an urgent trip, but he delayed his journey to fellowship with the church at Troas in the observance of the Lord's supper (verse 7). Even though this no doubt inconvenienced him, he was not free to observe the Lord's supper on any of the six days preceding the Lord's day. The Lord's supper is a memorial of the Lord's death, and is to be observed only on the Lord's day (Revelation 1:10) - the day Jesus arose from the dead. God wants those in the kingdom to observe the biblical pattern (Heb. 8:5), regarding the Lord's supper "until" the Lord's return (1 Cor. 11:26). At that time there will be no need of a reminder of Christ because we will be in his presence (Rev. 22:3-5) and ". . . we shall see him as he is" (1 John 3:2). Discuss the merits of this statement: "The annual, semi-annual, quarterly or monthly observance of the Lord's supper is just another attempt by the devil to make Christianity a bloodless religion. The Bible is a continuous whole. It reveals the progressive unfolding of the redemptive plan of God over a period of hundreds of years. How can a recognition of this fact lead to a fuller understanding of the Lord's supper? If the kingdom and the church are not just different descriptions of the same institution - then why did the early Christians partake of the Lord's supper? (cf. Luke 22:29-30). Discuss why the Lord's supper is to be observed "every? Lord's day and "only" on the Lord's day."